Plenty of sunshine. High 62F. Winds NNW at 10 to 15 mph.. 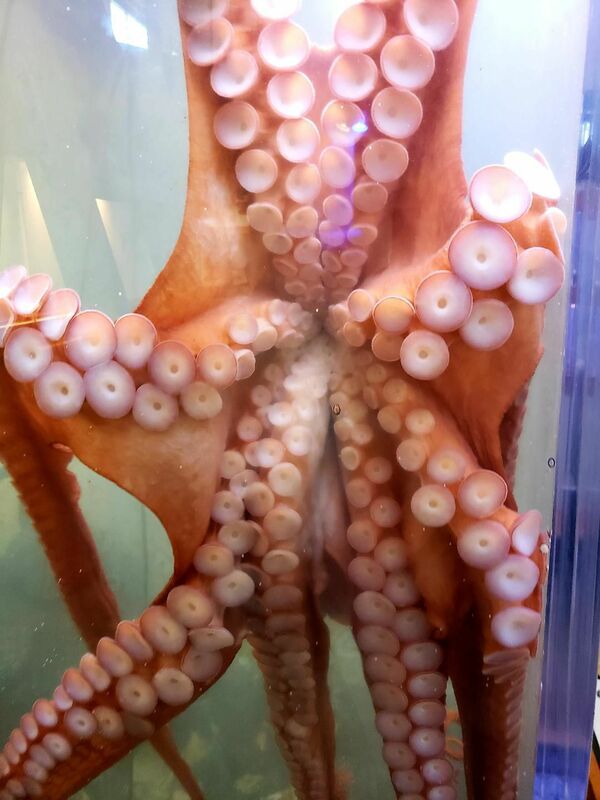 Housed at Charleston Marine Life Center starting in May 2018 this Giant Pacific Octopus, Octavius outgrew his tank. Howdy everyone! We’ve had more amazing weather lately with sunshine and low to mid-sixties, not to be confused with the Midwest and their negative mid-sixties. This is with the windchill factored in mind you but regardless I still think we win in terms of best weather in America this winter. Folks are catching steelhead and we’ve had some great ocean days with lots of lingcod and rockfish as well as crab. In the bay the crabbing is still good but the rockfish has slowed down lately and there’s one or two seals that are stealing most everyone’s catch. Its also sports-show season and don’t forget to come and say hi to me in Eugene Feb. 1 to March 3, in Roseburg Feb. 15-17, Medford Feb. 22-24, and Anderson, Calif. March 1-3. I’ll be the guy with the cowboy hat and microphone getting in trouble with the event promoter. Last year I kept announcing that Jody Smith (guide extraordinaire by the way) was going to attempt to break his world record of juggling a dozen live trout at the ODFW demonstration tank. Jody of course holds no such record that I am aware of and I’m pretty sure the ODFW would not really let anyone juggle the trout. Truth be told I have never seen Jody juggle any fish and I would like to take this moment to challenge him to do it. I would even accept frozen herring as a suitable juggling…thing…whatever they’re called. The people have spoken! Jody, do NOT disappoint us. This week the amazing Charleston Marine Life Center released their resident octopus Octavius back into the wild from which it came. Last May the Center got a tiny little octopus that soon became their star attraction but with Octavius’ fame also came the burdens of life in the public eye, soon rumors of substance abuse abounded and several lawsuits…no, sorry, that’s Kevin Spacey. Octavius soon outgrew his tank and plans were put in place to release him back home. Permits were acquired, staff briefed, plans were drawn and finally the day came. Now for some science stuff. Octopus are cephalopods which are defined as large predatory mollusks, squid also are cephalopods but not near as cool or creepy. In our area we have the Red Octopus and the Giant Pacific Octopus which is the largest octopus species in the world. The young of these two species can only be told apart by three little bumps below the eye of the Red octopus. At maturity the Red octopus weighs in at 1.5 pounds at the most while the Giant Pacific weighs in at about fifty to ninety pounds at the very high end. This means every large octopus that has been caught over about a pound and a half is of the Giant Pacific variety. These animals are amazing to interact with and throw back, save for lingcod bait, or smoke and eat. I have smoked some of them in the back of the shop and they are amazing although I honestly don’t know if I can eat another one after having several interactions with these amazing creatures. Octopus live in rocky areas and love to make a home in a small pocket or cave. They feed on clams, snails, small crab and fish. Some interesting facts about octopus are that they have 3 hearts and up to 200 suckers on each arm. The Giant Pacific Octopus lives three to six years. The Red Octopus can and will bite you given the chance mostly because they have “little octopus syndrome” and want to show you who’s boss. They also sometimes get belligerent at parties. There’s a lot more to these amazing creatures than space allows me to write but I hope this sheds a little light on another one of our amazing species in the amazing place we call our home. Rob Gensorek is the owner of Basin Tackle www.basintackle.com in the Charleston Marina and can be reached by phone at (541) 888-FISH, by Facebook at Basin Tackle Charleston, or e-mail at basin_tackle@yahoo.com. Robs fishing reports can be heard daily at 6:20 a.m. and 4:20 p.m. on KRSB Best Country 103 out of Roseburg and his Basin Tackle Outdoor Show can be heard Wednesdays at 3 p.m. and Saturdays at 6 a.m. at kwro.com. In addition to all this he sometimes actually gets out and catches a fish or two.